2018 Update: We still love these purple pumps, but you may want to check out our latest roundup purple heels for the office! Sure, we all know what basics professional women are supposed to have in their closets, but if you’re buying one for the first time or replacing one you’ve worn into the ground, it can be a pain to find exactly the right incarnation in stores. In “The Hunt,” we search the stores for a basic item that every woman should have. I always feel like purple pumps are a Corporette classic — they’re not what you’d normally think of for conservative business attire, but they’re usually dark enough to be conservative, and they’re incredibly versatile. They add a great punch of color to a number of neutrals (black, navy, gray, beige, white), as well as a bit of a fun accent with outfits based around greens, reds, or yellows (as a contrasting color) or blues (as a complimenting one). I’d avoid wearing them with pink, but maybe that’s just me. 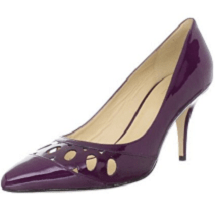 Readers, do you like purple pumps as much as I do? What other colors of shoes have you found to be surprising basics? Not included below, but: if you’re really confident in your purple shoes, try these very bright purple pumps (The Limited and Jessica Simpson); if you’re more of a wedge-wearer try these pairs (Fitzwell and Gucci). N.B. : Peep toes are not appropriate for every office — know your office! Update: Both 6pm and Rockport have a closed-toe version as well, huzzah! Like this feature? Check out other recent installments! I loooove purple. I have lots of pieces (dress, sweater, even blazer) and a pair of shoes, in purple for work. Now, my thread jack. Does anyone have experience ordering a diamond engagement ring online? The bf and I are working together on selecting the ring (which works for us! I know some of you may have different opinions on this though), and we quickly realized sites like James Allen will beat all jewelry store prices. Have any of you ladies bought diamond engagement rings or other diamond jewelry from James Allen? I meant to add a couple more details. We’re looking for a 1 carat (or so) diamond, and like that James Allen has the actual photos. Also, they have a 60 day return policy, so our worst case scenario is sending something back. But after he proposes, I’d like to wear the ring, not wait a few weeks for another one, so we’d like to get it right the first time. Would love any and all advice! Haven’t purchased form James Allen, but I have heard good things, especially from people who bought the stone from James Allen and then got it set elsewhere (apparently James Allen doesn’t have a large selection of settings). Have also heard decent things about Costco’s diamonds (although that was a few years ago, not sure if things have changed). Good luck and early congrats! My husband bought my ring on Blue Nile’s website (after we picked it out together – worked for us, too!). We loved Blue Nile so much that we actually used them for our wedding bands as well (and I’ve used them for other gifts since). My husband bought my engagement ring (diamond and setting) on Blue Nile after my brother in law had a good experience ordering my sister’s diamond (but not ring) from there (he had a family setting already). I love love love my ring. We did the same as AinRVA and went to a brick and mortar store to measure so he knew what size to order. another Blue Nile Fan. Fiance ordered the rock from there, and ended up getting the setting there as well after having the rock for a while and shopping around for a setting. I had to send it back to get sized, and they were great about that too. My engagement ring and our wedding bands are Blue Nile. Great customer service, easy exchanges. My ring has been sized once, and his three times – Shaneco’s measurements were wrong. I love BlueNile. I can recommend engagement rings direct ( ERD) mark Turnowski . Check out price scope for reviews. You should check out Pricescope dot com. Its a diamond/jewelry forum that has a TON of info on buying online including what to look for as well as reputable vendors. If you’re really looking to maximize your budget (and don’t have superstitions about pre owned diamonds) I’d also suggest looking at the secondary market. I second Pricescope with two big thumbs up. Those folks really know their diamonds! After reading there we bought at Whiteflash and had a great experience. We got my wedding band from Green Karat–it’s very nice, and exactly what I wanted, but it took longer than expected to ship (wasn’t a problem, just wasn’t expecting it to take so long). They sent me a plastic sizer before we ordered, so that’s how I did the sizing, the ring fits well. I have a diamond necklace from Brilliant Earth, it’s very pretty, and I thought they made the diamond info very clear when we were shopping. I have a plain silver necklace from Blue Nile, and I am always happy with shopping there (I’ve bought some gifts from them, too). I second the suggestion of looking into preowned diamonds/rings–my engagement ring is from the estate case of a local jeweler (DH and I picked it out together–worked for us, too). My husband purchased my ring from James Allen, and it’s been wonderful. I didn’t work with him on the purchase at all, he totally surprised me. He said he went to Robbins Bros. to look at some diamonds in person, just so that he could get a feel for what inclusions/colors, etc. look like, and then he went online and found my ring. At the time, it was a new engagement design, so it didn’t have matching wedding bands. We had the bands custom-made by a local jeweler with no problems. After the positive experience ordering my ring online, we decided to order his wedding band online as well. He wanted a titanium ring, and we just searched until we found one he liked. We had both rings appraised, and my ring came with a GIA certificate. The certificate, combined with strong online reviews, and the confirmation from the appraisal made us confident in the quality, etc. Highly, highly recommend going online! Thank you for all the site ideas and advice so far ladies. It’s encouraging to hear that making the decision to buy the ring online has worked out so well for some of you! A friend bought his fiancee’s ring from Blue Nile and was extremely happy with it. My DH bought the diamond and had it set through an online broker. He said the prices were much better and there was a greater selection of diamonds. He had a specific diamond in mind. We used BlueNile several years ago for a fairly high-end ring with good results. According to my DH, the service staff were excellent and responsive to his requests. And it was around 30% less than comparable jewelry store prices. For a major anniversary, my husband bought me a 3 carat diamond from Blue Nile. It came with GIA certification. We were extremely happy with Blue Nile’s price, quality, and service, and of course we were delighted that we didn’t have to pay sales tax. Once we’d unofficially agreed to get married, I waited a loooooong summer for the official proposal. Special moments came and went. Mountaintop picnics… a restaurant dinner overlooking the Canada Day fireworks… multiple evening walks on the beach… and narry a sparkle to be seen. Moral of the story: Avoid Greenkarat.com like the plague! Posting late but my fiancee had a great experience at brilliantearth [dot] com and I completely love the ring! I looove the Kate Spades! And today is my birthday! Does that justify me dropping $300 on purple shoes? I hope so. OH YES IT DOES! Happy birthday! I love those too, but it’s not my birthday. I think they would make a GREAT happy birthday to you present!! Yes, because they will make you smile every time you wear them. Best happy birthday to me present ever! Yes, because I really really really want those, but can’t justify them. Someone should have them! Heck yeah, it does – and Happy Birthday! FWIW, I love Kate Spade shoes. So comfortable! Happy birthday! Maybe we should start calling ourselves the C*rporette-enablers. I <3 <3 <3 those Kate Spade shoes and would be beside myself jealous if you got them, but you totally should. Happy Birthday. I cannot think of a better reason than that! Happy Birthday Kay! I love Costco for diamonds! Their website has an incredible selection, and if they don’t have exactly what you want, you can call them and they will probably be able to find it. For diamonds of a specific color/clarity, they are great. If you had a specific setting from elsewhere you wanted to use, you could always get the diamond from Costco in the cheapest gold setting and have it reset. For me, the quality of the diamond was the #1 priority. That being said, I also wanted a setting no one else would have, which we found through an estate jewelry company – Dianne’s Old and New Estates. They do vintage pieces that are absolutely amazing. My fiance purchased my engagement ring through James Allen, and we had a very positive experience. I did have to send it back to get re-sized, which was also very hassle-free – they provided a box to ship it in, insurance, etc. We were worried about getting it re-sized because it was engraved, but they did the engraving again for no extra charge. I have the Aerosoles Playhouse in purple, for the comfort footwear-minded among us. 2-1/4″ heel and rounded toebox. And they match a new vegetable I’ve discovered – purple cabbage. I don’t know why it took me so long to try it (maybe cuz I find regular cabbage gross tasting) but YUMMY. And my lunch matches my shoes, which makes me happy. Thanks for the reco. It’s in my cart! Does any one have any tips for staying organized? I am currently working and a different projects with different teams and they all seem to be picking up speek at the same time! How do I stay organized and on task?? My best tip is: Don’t rely on yourself to remember anything. I keep a list of all my assignments and under each assignment I have written the status and next steps that need to be taken, along with deadlines. I schedule every deadline and meeting in my calendar as soon as I know about it. I add every task that I don’t do as soon as I think of it to a to-do list. If an email needs follow-up I either do it right away or flag the email. How about a task spreadsheet for each project? With columns for who the responsible party is, the stages of completeness, due date, descriptions, notes, etc. 2. I have a blotter calendar, and I write deadlines for giving feedback, etc. on it–works better for me than putting deadlines into my email calendar. I have a pair of burgundy patent pumps that I love for a pop of color: http://www.6pm.com/product/7851049/color/100054. I always get compliments when I wear them. I would like a purple wedge WITHOUT a peep toe for the summer. I do NOT like to have my toes exposed in the City, b/c there are a lot of VERY dirty puddel’s to step thru. Kat moderated me out this morning, and I am still worreid b/c the manageing partner is still mad b/c I forgot all about his CLE at NYU this weekend. He invited me to go but I forgot and got my hair done. He called but I did NOT get his message; then I went and got shoes at Lord and Taylor. He is mad I think b/c he wanted to show me off to his law school freinds. I do NOT like to be in the dog house, but he realy is MAD this time! Help! Ellen, don’t you know it’s PUDDELS, NOT PUDDEL’S???? You must starte to pay more ATTENSHUN. Oooh I feel so trendy, I just bought some bright purple pumps this weekend and I LOVE them! Just wanted to throw in something I learned from years working in retail: purple almost always goes on sale. Don’t pay full price for purple! The purple version of things, even styles that sold well in other colors, always seemed to get discounted. how interesting. for me, if it’s available in purple it means i buy it. purple is my go-to color, it always seems bright enough/subdued enough/professional enough/playful enough/creative enough (to my eye). plus it, looks awesome with navy and gray, my favorite neutrals. This is good to know – thanks for sharing! I have two pairs of purple pumps. One pair of basic pointy-toed suede pumps that I wear regularly with black and white or gray. The other are Guess peeptoes with a patent bow that wraps around the front. I don’t have anything to wear with them at the moment but wore them a lot a couple of years ago. Love the Elizabeth & James pumps. The bow makes them a little girlier. The Kate Spade with the cutouts are pretty nice, too. Interview with a software company in the gaming industry (not a legal job but a business one). Yay! I’ll wear a suit, but am afraid of looking stuffy in an office and setting that is all about play and very casual attire. Should I infuse an element of fun in the shell I wear under the suit? In jewellery? Wondering if I should pop by the Ann Taylor sale to look for a shell or shoes. Or am I overthinking this? not sure what color suit you’re thinking, but a graphic print shell may be fun — let’s say your suit is charcoal, a black & white ikat print shell would look very fun/polished/professional. i don’t think an interview is the right place for fun shoes, i find that people get easily distracted by them, or you quickly become that girl with the purple shoes. Not sure if this is too late for you to see this but…. My husband is at a software company and interviews candidates. They pretty much blanket don’t hire people who come in a full suit because they figure they weren’t smart enough to do their homework on the company. Try to find out whether a suit is really necessary; might be more appropriate to go in a blazer and dark trouser jeans. If you have an appropriate contact you could ask about attire, that would be good. Hmm… R in Boston, that concerns me a bit, but I’ll try and find out what would be appropriate. Thanks! Just a heads up – I own the Jessica Simpson suggestion in pink and would not recommend them. They are incredibly uncomfortable and I’m pretty good about not complaining about shoes. I just want to say that I love your username. But that could also be due to the fact that I’m Godzilla. I don’t have any purple shoes but do have 2 pairs of red shoes in my office shoe rack. I just realized that of the 13 pairs of shoes I have in the office, only 2 are black! You know, I have several pairs of black shoes (out of the 80 or so pairs of shoes I own) but none of them are plain black leather pumps. I sing at a lot of funerals and needed black pumps and ended up buying black lace pumps instead. I have some purple peep-toes that I love. Favorite colored pumps? Blue suede from Zara that I saw and had to impulse buy. Those Gucci wedges are out of this world. Wow. The first pair (Kate Spade) is cute, but the heels are all too high. I’m recovering from an extremely serious ankle sprain. It didn’t happen because of high heels, but it could have with heels that high.